Aaron Kaufman returns on the FrostClick scene with Origami, a five-track album jam-packed with funky acoustic melodies. Unlike his previous album Hello, Dear EP which was also featured here, the 20-year old singer/songwriter from Houston gives us the same boy-next-door charm but with an edgier approach. With rock guitar play-ups and drum-induced arrangement, Kaufman unravels his musical maturity as he stretches out beyond conventional acoustic rhytms. I’m Cheating On You opens up with a lot jazz and infectious melodies. This upbeat ensemble will surely make you dance, as guitar solos and solid vocals flows perfectly throughout the track. Mellowing down a bit, Your Love Carries On opens with a stripped-down acoustic building into a saccharine chorus that gently sways with its hooking arrangement. In Aimee (I’ll Be There), Kaufman explores the ambient acoustic department as ghostly vocals steadily flutters with tribal-sounding beats and subtle guitar strings. Title track Origami, on the other hand, is the perfect soundtrack for intimate dinners with your loved ones. Press play and let this sonic gem charm you with its rhytmic pauses and simple yet soothing delivery. Sealing up the album with a nostalgic vibe, Modern Girl highlights Kaufman’s ability to play with silent and slow pulsing melodies evoking hidden emotions. 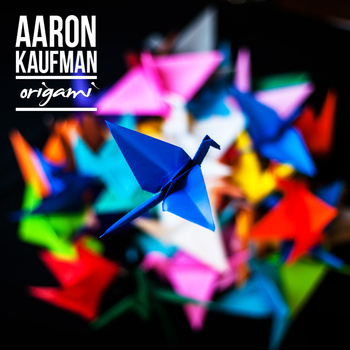 Aaron Kaufman‘s precision and control with his music has been clearly reflected in Origami. He provides just the right space for his sound to build up and disintegrate on their own, creating a slow burning impact to our ears.